Rift Valley fever (RVF) virus is associated with recurring disease epidemics among livestock and humans in sub-Saharan Africa and Middle East, where the virus is endemic in certain ecosystems. Since the mechanisms of its maintenance during the long (4–10 year) inter-epidemic periods (IEPs) are poorly understood, we reviewed the latest findings that shed light on this, and identify ecological factors unique to the endemic areas. Recent studies reported acute RVF cases in humans and livestock, and significant disease prevalence during IEPs, indicating low-level cycling of the virus in wildlife, livestock, and humans. Niche modeling identified ecological factors that seem important in supporting the mosquito vector and virus maintenance, and the occurrence of RVF epidemics. The virus is primarily maintained by circulating at low levels among wildlife, livestock, and humans, transmitted by mosquito vectors in ecosystems characterized by low annual rainfall during non-El Niño climatic periods and certain soil types. The findings indicate that prolonged survival of the virus in mosquito eggs, suggested in previous studies, may not be required for its maintenance. Rift Valley fever (RVF) virus is a zoonotic mosquito-borne member of the Bunyaviridae family of viruses associated with periodic epidemics of perinatal deaths and abortions in livestock (cattle, sheep, goats, and camels), and acute febrile illness, encephalitis, retinitis, and hemorrhagic syndrome in humans. The virus was first isolated in Kenya in 1931, almost 20 years after the first RVF-like disease in the country. Between 1950 and 2007, the RVF virus spread across the African continent, where up to 12 countries had reported severe epidemics, and another 16 countries demonstrated serological evidence of the disease [1, 2, 3, 4]. In 2000, a severe epidemic involving humans and livestock occurred in Saudi Arabia and Yemen in the Middle East, resulting in the virus becoming endemic and causing recurrent epidemics in that regions [5, 6]. Experts predict that that the risk of even more severe epidemics in these regions and other parts of the world is increasing, in part, due to the changing global weather patterns and human-animal interactions. The epidemiology of RVF in Africa and Middle East indicates that once the virus is introduced in a country, it becomes endemic and causes periodic epidemic every 4–10 years, associated with heavy rainfall and flooding, and resulting in extensive morbidity and mortality among livestock and humans, and extensive economic losses associated with loss of livestock and prolonged restriction in livestock trade [reviewed in 6]. The RVF epidemics are separated by long inter-epidemic periods (IEPs) characterized by low disease activity in livestock and humans. Within countries where the RVF disease occurs, there are certain permissive ecologies prone to epidemics, where the virus is amplified in livestock population and spread to infect other livestock and humans in expansive areas. The mechanism of virus persistence in these endemic ecologies is not well understood. Using historical record and recent epidemics, we developed an occurrence map for RVF in Kenya, identifying 20 of 47 (42.6%) counties as high, 11 (23.4%) as medium, and 16 (34%) as low-risk regions [7••]. 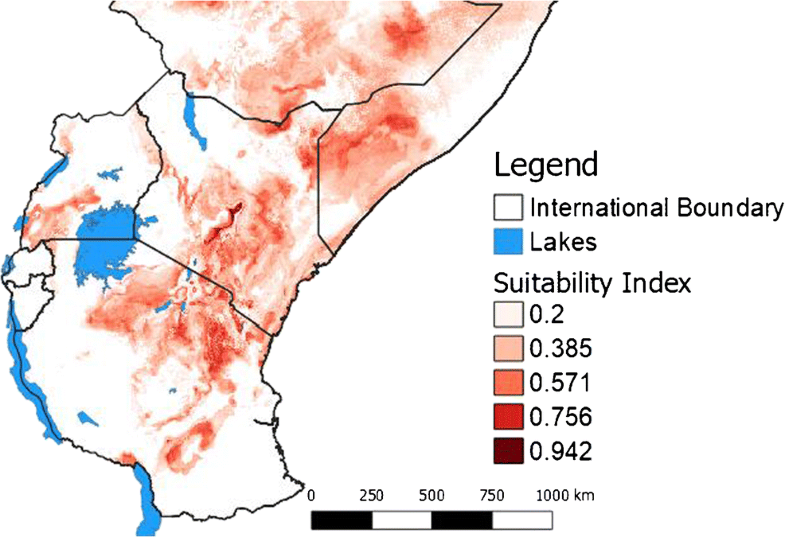 The high-risk counties are scattered across all agro-ecological zones of the country, ranging from agro-alpine and high potential zones to the arid and semi-arid zones. Within each high- and medium-risk county, there are certain permissive ecologies that support RVF virus maintenance and recurrent epidemics, while the rest of the localities do not experience RVF epidemics [7••]. The findings suggested that specific geologic and geographic factors are associated with permissive high-risk areas. Ecological niche modeling studies identified some of the factors, including presence of certain soil types, less than 100 mm average annual rainfall during non-El Niño years, and altitude below 1000 m. Here, we review recent studies with a focus on improving the understanding of mechanisms of RVF virus maintenance in endemic ecologies and to highlight ecological factors important for its maintenance. Earlier studies in endemic areas suggested that RVF virus is maintained in the eggs of Aedes mosquitoes belonging to the subgenera Neomelaniconion (e.g, Aedes mccintoshi) and Aedimorphus [8, 9]. The mosquitoes were found in specific grassland depressions referred to as dambos, and during the IEPs infected mosquito eggs remained viable but buried in soil. When the dambos got flooded during the rainy seasons, transovarially infected Aedes mosquito eggs hatched, the larvae matured, and adult mosquitoes transmitted the virus to domestic animals, including sheep, goats, cattle, and camels to cause an epidemic . During RVF epidemics, heavy rains and flooding that occurred during El Niño climatic seasons triggered hatching of a large number of both Aedes and Culex mosquitoes that got infected by feeding on infected animals and humans, and then transmitted the virus to more livestock and humans, resulting in extensive amplification of virus and spread to other regions through livestock and mosquito movement. Whereas the dynamics of progression to an epidemic remain the same, recent studies have supported an alternative hypothesis for the maintenance of virus during IEPs. In 2010, a study showed the RVF virus prevalence of 3–18% among sheep and goats during the 1998–2005 IEP in East Africa . Further, in the inter-epidemic period after the 2006/2007 epidemic, we conducted a study in the Northeastern province of Kenya, the epicenter of the 1997/1998 and 2006/2007 RVF epidemics, and found that 57 of 366 (15.6%) human fever patients at a local hospital were IgG-positive for RVF, whereas 14 of 366 (3.8%) were positive for acute RVF disease by either IgM (N = 10) or PCR (N = 4) test (Table 1). In another study, livestock sentinel herds located in RVF hotspots across Kenya, including the Northeastern province were consistently seropositive for RVF virus during an inter-epidemic period years . Taken together, these findings suggested presence of RVF virus cycling during IEPs, which involves continuous but low-level infection of livestock, humans, and mosquitoes (Fig. 1). In the uninhabited forests and wooded areas of the country, the virus circulates between wild animals and insect vectors. Herbivore wildlife animals are the primary wildlife species as demonstrated in a study that showed presence of neutralizing RVF virus IgG antibodies in Kenyan wildlife through several decades but with increasing levels during major RVF epidemics . Other recent studies have supported the presence of this endemic maintenance cycle by demonstrating presence of RVF IgG antibodies among humans and livestock, even in regions that had never reported RVF epidemics (summarized in Table 2 [references 13, 14, 15, 16••, 17, 18, 19, 20, 21, 22, 23•,24, 25, 26, 27, 28, 29]). Some of these studies also reported presence of acute RVF human cases (positive by PCR or IgM) during inter-epidemic periods (Table 2). 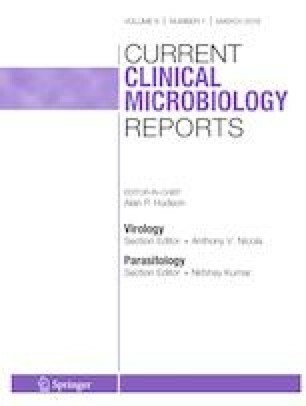 An interesting study from Uganda, a country that had not reported an RVF epidemic, found a prevalence of 12% in human and 13% in livestock, suggesting that the virus has been circulating undetected in the country probably for a long time [16••]. The Ugandan study carried out in the western region of the country that was recently identified as a high risk area by our niche modeling studies, found 1.5% of the humans positive for acute RVF disease; and the human positivity was associated with presence of seropositive livestock [16••]. The domestic animals involved in the maintenance cycle are cattle, sheep, goats, and camel, species that live in particularly close contact with humans among the pastoralist communities of sub-Saharan Africa and the Middle East, and these animals also serve as the primary animal-source foods. This makes it unlikely that there is classical enzootic maintenance RVF cycle that does not involve humans as previously described. The earlier lack of data on human infectious during IEPs was mostly associated with low suspicion index for the disease among clinical staff in endemic areas, absence of reliable routine diagnostic testing, and the mild nature of clinical disease in most of human cases associated mosquito transmission. This cryptic cycle in the endemic areas during IEPs often remain undetected due to low incidence of infection, unless intensive surveillance activities are carried out. However, virus activity can easily be demonstrated through random isolations from mosquitoes, small local RVF epidemics in livestock, or by occasional human disease. Clinical disease in humans or animals is generally missed in the absence of specific, well-focused, active surveillance. Recent entomologic studies also support continuous transmission of RVF virus during IEPs by demonstrating that Aedes mosquito species, identified as the primary vector for RVF virus, circulates in endemic regions throughout the year in IEPs, but increasing in number during the rainy seasons [30•]. Genetic analysis of the vectors indicated that A. mccintoshi species vary in different regions, with a one member of these species unique to the recent RVF hotspot in northeastern Kenya [31•]. In contract, A. ochraceus is a homogeneous population across most countries in sub-Saharan Africa that experience RVF epidemics, but undergoing rapid expansion. [31•]. Qualitative analysis of RVF vector models showed that low but consistent birth rate of both Aedes and Culex mosquitoes during IEPs, and a presence of a certain number of infected Aedes mosquitoes . The study showed that the Aedes spp. present during IEPs had the potential to initiate RVF epidemics through transovarial transmission and sustain low levels of the disease  (Fig. 1). Apart from the well-documented importance of climatological factors on occurrence of RVF epidemics, there are limited data on the geological, geographic, and demographic factors important for virus maintenance. Such information would be useful in developing country-specific RVF risk map, important for developing and implementing prevention and control measures against the disease. A study that analyzed human RVF incidence during the 2006–2007 RVF epidemic in Kenya showed that the locations the solonetz, calcisols, solonchaks, and planosols soil types was highly associated with disease occurrence . In addition, the study showed that RVF disease was more likely to occur on plains and in densely bushed areas at low elevations . 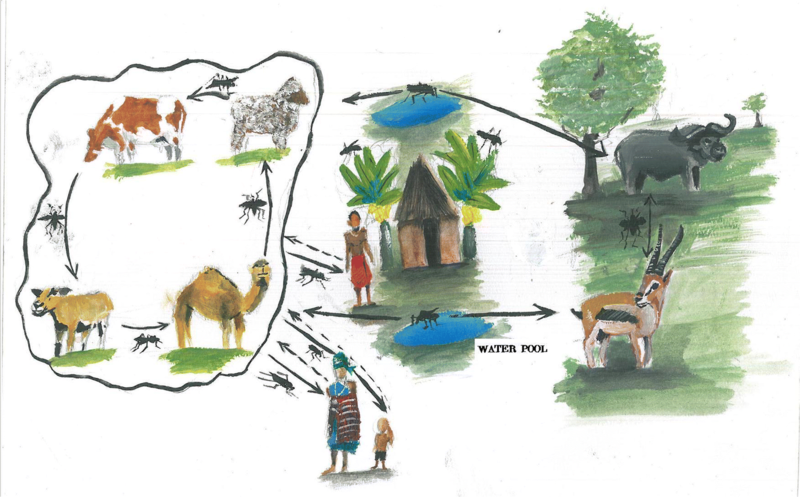 More recently, our group used surveillance records from the past 60 years and ecological and climatic factors associated with the 1997/1998 and 2006/2007 RVF epidemics in East Africa to determine the risk of exposure and outcome of the disease and develop an RVF risk map for Kenya [34••]. The risk of exposure to RVF was defined as the proportion of the epidemic years that an administrative district was involved in prior epidemics, whereas risk of outcome was defined as severity of observed disease in humans and animals for the district. The study also used data from the 2006/2007 epidemic, the most extensive and best characterized RVF epidemic in Kenya, to assign the predictive risk factors for epidemic occurrence for each district. The resulting risk map classified 26% of the country’s administrative districts as high risk, 26% as medium risk, and 48% as low risk. The identified ecological factors important for disease occurrence included low amount of rainfall during non-El Niño climatic periods, low altitude below 1000 m above sea level, and presence of solonertz, luvisols, and vertisols soil types [7••]. We recently expanded the risk map to cover the eastern Africa region countries of Ethiopia, Somalia, Kenya, Uganda, and Tanzania (Fig. 2) using the Random Forest (RF) algorithm that combined data on known occurrence of the disease, environmental (rainfall and temperature), geologic (soil type), and topographic (altitude and land cover) data that as predictors (Fig. 2). Rainfall and temperature data were downloaded from the WorldClim at the resolution of 1 km (http://worldclim.org/version2). These included 19 bioclimatic variables that have been used extensively for modeling ecological niches for various species. Soil data were obtained from the World Soil Information database at a resolution of 250 m (http://isric.org/), land cover data were downloaded from the European Space Agency at a resolution of 300 m (https://www.esa-landcover-cci.org/?q=node/175), while the elevation data were obtained from the Shuttle Radar Topography Mission (SRTM) at a resolution of 90 m (ftp://ftp.glcf.umd.edu/glcf/SRTM/) (Fig. 2). Soil types that had highest frequencies of positive cases included nitisols (with 17/21 records, 81.0%), solonetz (6/14, or 42.9%), and vertisols (7/17, 41.2%). The mean annual rainfall was lower in the occurrence sites compared to those used for reference. This is also reflected in the rainfall distribution for the wettest and driest quarters and the wettest month. Mean temperatures of the driest quarter was more variable in the infected areas than the non-infected areas. Although this analysis showed that land cover and altitude did not significantly predict ecological niches of RVF, altitude appeared to influence the other ecological conditions that were found to be important in predicting RVF niches especially rainfall and temperature. Ecosystems in low altitudes, for instance, experienced irregular climate patterns that increase turnover rates of livestock and wildlife populations, in turn compromising the maintenance of appreciable levels of herd immunity. Inclusion of multiple variables in the model invariably prioritized proximal variables over indirect variables that operated via intervening variables. This probably provided justification why previous studies with limited number of rainfall and temperature data identified altitude as one of the important predictors, whereas in cases where multiple rainfall and temperature data were included (for instance in the present analysis), altitude was rendered unimportant. The positive association between soil types vertisols, solonertz, and nitisols with high risk of RVF epidemics may be associated with the poor draining properties of these soils, allowing them to get saturated faster and hold water for a longer time compared to the other soil types. In addition, anecdotal observations also suggest that these poor draining properties allow these soils to retain high moisture levels during the dry season to enable the survival of infected eggs of floodwater Aedes species that act as the primary reservoirs of RVFV. Retrospective analyses conducted in South Africa also suggested that inclusion of rainfall and soil saturation data in the prediction model allowed for the identification of about 90% of the cases with a 1-month lead time [34••]. To verify these suggestions, data on mosquito profiles in various districts in Kenya would be required. These data are currently being collected in one of our research projects. The increasing human population as well as climate change and variability are expected to drive changes in ecological niches of RVF in the future. In arid and semi-arid areas of Kenya for instance, irrigation is being introduced to mitigate food insecurity challenges. The establishment of large pools of standing water and maintenance of high humidity increases the suitability of these to endemic RVF [35•]. Analyses of the impact of climate change of RVF has been conducted [36, 37]. They show that parts of central Kenya, central Uganda, and northern Tanzania are likely to become more suitable for RVF. Climate change predictions show that these areas would receive more rainfall. Early studies suggested that the RVF virus was maintained during IEPs by surviving in the eggs of Aedes mosquitoes buried in soil for prolonged periods. Here, we present data from recent studies and our unpublished findings to support RVF virus maintenance through low-level cycling between susceptible vertebrate host (domestic and wildlife) and humans, transmitted by mosquitoes primarily in ecosystems characterized by certain soil types and low annual rainfall during non-El Niño climatic seasons. We thank Dr John Gachohi for his assistance in developing the RVF maintenance cycle figure. M. Kariuki Njenga and Bernard Bett declare that they have no conflict of interest. The study protocol used to collect data presented in Table 1 was approved by the institutional review boards of Kenya Medical Research Institute in compliance with all applicable regulations governing the protection of human subjects. •• Munyua PM, Murithi RM, Ithondeka P, Hightower A, Thumbi SM, Anyangu SA, et al. Predictive factors and risk mapping for Rift Valley fever epidemics in Kenya. PLoS One. 2016; https://doi.org/10.1371/journal.pone.0144570. This study describes the process of developing a RVF risk map for a country and identifies a few ecological factors that appear to be important for the high risk areas in a country. • Mbotha D, Bett B, Kairu-Wanyoike S, Grace D, Kihara A, Wainaina M, et al. Inter-epidemic Rift Valley fever virus seroconversions in an irrigation scheme in Bura, south-east Kenya. Transbound Emerg Dis. 2017; https://doi.org/10.1111/tbed.12674. This study highlights how change in land use can increase the risk level of an area to an RVF disease.